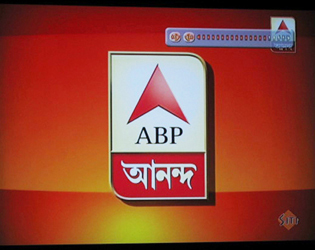 (Left) Logo of “ABP Ananda”, one of the most popular TV channels located in Kolkata, India, that belongs to the ABP Group. 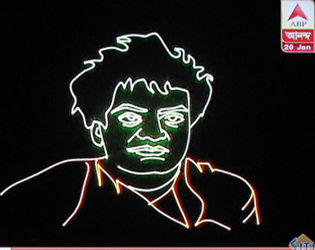 (Right) The station ran promotional contents for two days preceding the unique show, addressing it as “Laser-Magic of Manick Sorcar”, “The life story of Swamiji in laser light”, “The first ever on television”, “The longest laser documentary on a human being”, and “Vivekananda in laser: Right after the short break”. 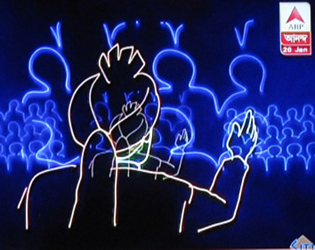 (Bottom) ”Vivekananda in Laser”, said the introductory page of the show. 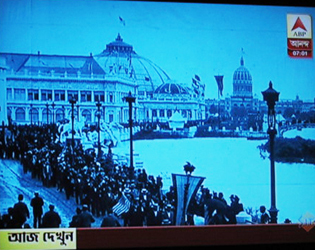 (Left) The show started with an open book with black and white images of the scenes from Columbian 1893 Exposition at Chicago. 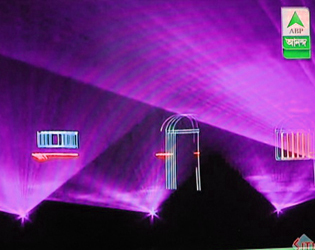 (Right) The “Parliament of Religions” at the Columbus Hall, The Art Institute, Chicago. 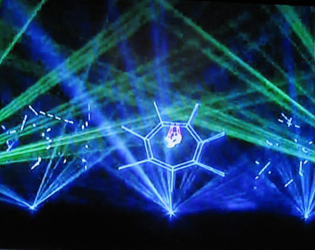 An estimated 4000 people were present at the hall. 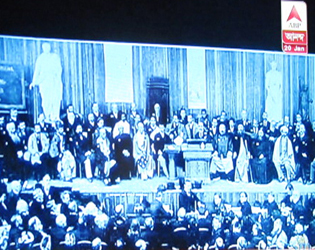 (Bottom) Swami Vivekananda delivers his famous speech, which received a standing ovation for over two minutes. 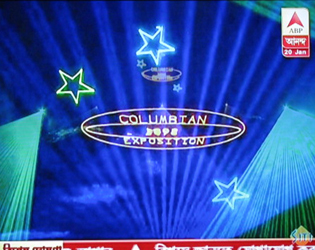 The non-stop winning stream climaxed at “ABP Ananda”, one of the most popular TV Channels of India. 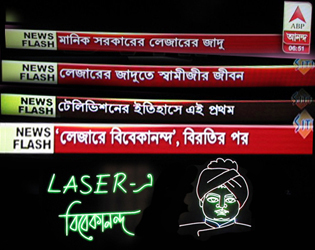 ABP Ananda (also known as “Anandabazar Patrika Ananda” and formerly, “STAR Ananda”) is a Bengali language 24-hour cable and satellite television news channel headquartered in Kolkata. It is owned by the ABP Group. 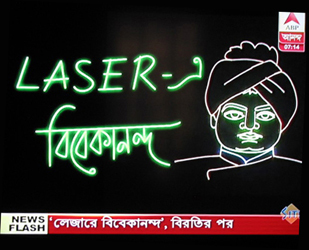 “We premiered the laser documentary on Swamiji at the Grand Theater of Science City, Kolkata on October 10, 2012 with virtually no publicity”, said Manick, “but people loved the show and it took off on its own. Words of mouth spread like fire, and we ended up showing it at various cities around India in addition to several times in Kolkata. After four months of show-tour as we got ready to return to the USA, it was picked up by a renowned TV Channel like ABP Ananda, which has audience in millions around the globe”. 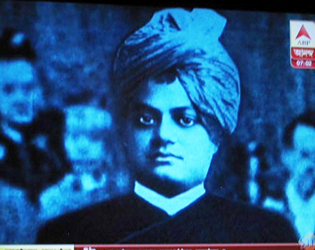 Swamiji was first telecast (internationally) in the morning of January 20, 2013, and it will be re-telecast a number of times over the months ahead. 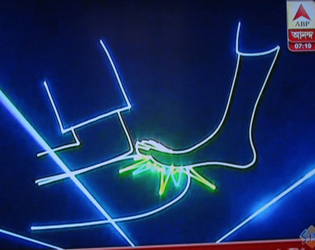 Please refer to your TV listing for the day and time. 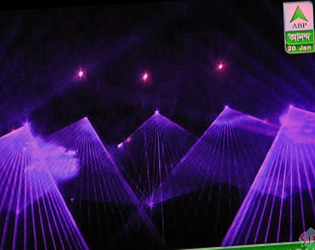 (Left) A gust of wind turns the pages back to the first page where laser takes over to narrate the entire story. 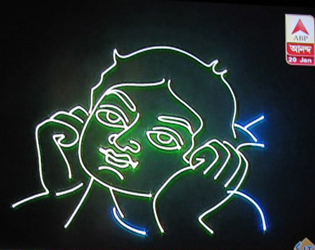 Here Biley listens to his mother as she tells the stories from the Ramayana, the Mahabharata, and the others. 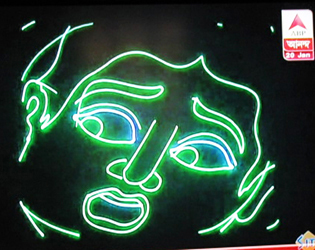 (Right) Biley’s imagination takes him to Rama, followed by Sita, and Lakshmana inside the forest. 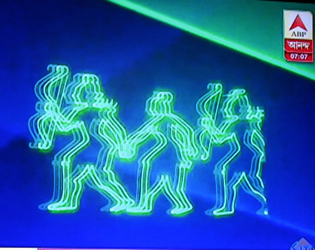 (Left) Ramakrishna touches Naren, and Naren begins to hallucinate. 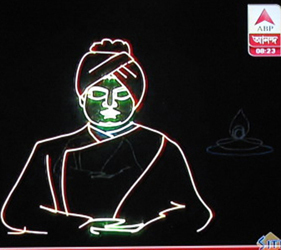 The Art Institute, Swami Vivekananda delivers his famous speech. (Left) July 4, 1902. 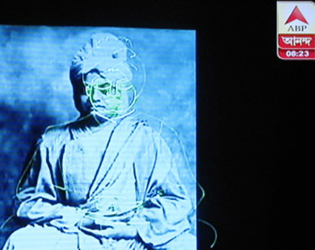 Swami Vivekananda attains Mahasamadhi” (Right)A black and white image of Swamiji at Mahasamadhi takes over the scene from laser to end the story from the book, just as the black and white images started in the beginning. Sraboni Basu: Congratulations to the entire team of Swamiji. Manick da, could u please let us know about any upcoming repeat telecast?